This is Tegan and Jack. Jack is a zebra. 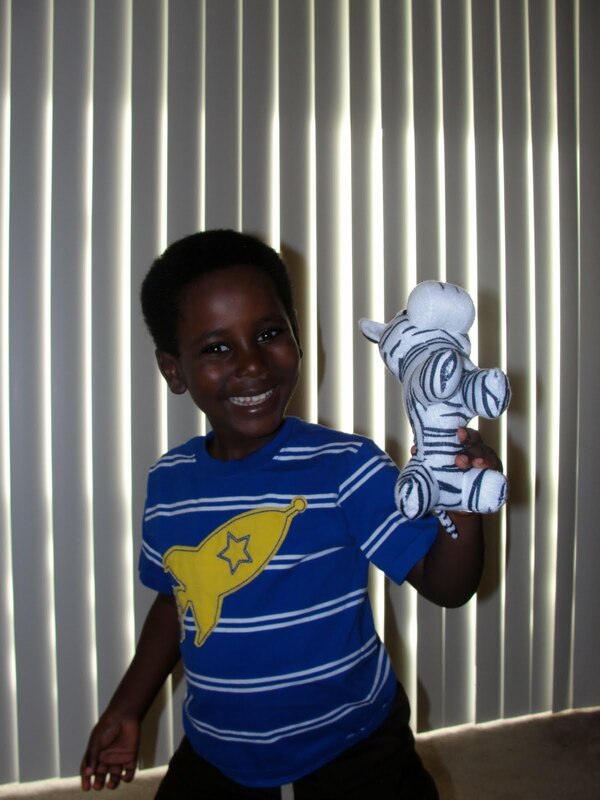 Tegan loves his zebra, and the story behind it is very interesting. Today, we had a service at a local community, and afterwards we went to lunch with the community leader. This pizza place has some video games, and the machine with a claw that can grab stuffed animals. Now, because they are the cutest boys in the world, people want to give them quarters and such, and that happened here. One of the kids who came to lunch with us, told Tegan he would help him and Preston win a stuffed animal. On the first try, he managed to snag a "Baby Shrek" for Preston, but he was unable to get the zebra that Tegan insisted he needed. Mom and Dad disagree, but that is a different story. Tegan of course, began to cry and we told him sorry, but there is nothing we can do about it. So the community leaders wife pulls out a dollar, remember they are cute; so people give them things, and the boy tried again. He actually hooked it both times, but it slipped out. Now Tegan is sad again, and he knows he is not getting it. Meanwhile...there is another girl there. You can tell she is an expert in this machine, as she has an arm full of stuffed animals, and she is reeling them in like its easy. She hears the cries, runs out to her car, comes back in and in 2 tries, has the zebra hooked and headed toward the chute. Tegan had a look of joy on his face, while saying its not mine....I dont get it. Suddenly..she hands it to Preston, who passes it off to Tegan; and she runs out the door. I grab Tegan and we run out, shouting "thank you"
As we come in, Tegan has a huge smile on his face, and says one thing.." I asked God to give me the zebra." So thats the story of Tegan and Jake, and how Father answered a somewhat selfish request, while at the same time showing a young boy just how awesome He is.